Like many of you, I am always intrigued by a good mystery; especially when it involves real-life scenarios. Such is the case of TWA Flight 800. As you will recall, TWA 800, a Boeing 747, was a scheduled international passenger flight from New York City to Rome, Italy, with a stopover in Paris, France. At about 8:31 PM, on July 17, 1996, nearly 12 minutes after takeoff from John F. Kennedy International Airport, TWA 800 exploded and crashed into the Atlantic Ocean near East Moriches, New York. Of the 230 passengers and crew on board, no survivors were found, making TWA 800 the second deadliest aircraft accident in the United States at that time. From the beginning, the cause of the crash was swirling in controversy. But from the first, there were many witnesses to the accident who claimed they had seen a "streak of light" that was usually described as ascending, moving to a point where a large fireball appeared. As one might suspect, there was intense public interest in these witness reports and much speculation that the reported streak of light was a missile that had struck TWA 800, causing the airplane to explode. Combine these on-site witnesses with the testimony of several commercial airline pilots, who being in the vicinity of JFK International Airport, reported that they saw a missile strike the plane. (I personally have a friend who is a retired airline pilot, whose colleagues were in the air over New York City that day, and corroborate this theory). Now we must take into account that the thought of terrorist attacks was far removed from the American consciousness at this point in our history. It was 1996, and the bombings of the World Trade Towers was still five years away, and the bombing of Pan Am Flight 103 was eight years in the past and took place over foreign soil. We Americans, if we are nothing else, are quick to forget and slow to ponder. So it is easy to surmise that we would not want to consider the possibility that a terrorist attack could happen in our homeland. And let's not forget that we had a Presidential election coming up. Wouldn't want anything to put a damper on that, would we? But at the time, there was enough interest paid to the eyewitness testimony that the FBI initiated a parallel criminal investigation alongside the NTSB's accident investigation. The search and recovery effort was long and extensive. Pieces of the airplane wreckage were discovered floating on and beneath the surface of the Atlantic Ocean about 8 miles south of East Moriches, New York. The main wreckage was found scattered on the ocean floor in an area about 4 miles long by 3 1/2 miles wide. In the end, over 95% of the airplane wreckage was eventually recovered. It was then transported by boat to shore and then by truck to leased hangar space at the former Grumman Aircraft facility in Calverton, New York, for storage, examination, and reconstruction. It wasn't long before the public began receiving the picture of the crash as formulated by NTSB investigators. They postulated that residue found on the wreckage indicated that the probable cause of the crash of TWA 800 was an explosion of flammable fuel/air vapors in a fuel tank, most likely from a short-circuit. Never mind the fact that the FBI viewed test results of the residue as possibly indicative of a criminal act. And there were the other less-publicized theories of an accidental "friendly fire" missile from the U.S. Navy, a terrorist missile strike or an on-board bomb. What is even less known is the theory that TWA 800 was blown up by a bomb intended to disrupt the trial of terrorist Ramzi Yousef, the nephew of Khalid Shaikh Mohammed and planner of the 1993 World Trade Center bombing. 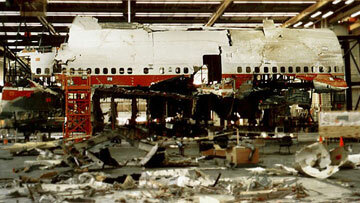 One of the most significant revelations by Yousef, documented in a series of FBI memos, obtained by author Peter Lance, for his book Cover Up: What the Government Is Still Hiding About the War on Terror, was a threat Yousef had made to put a bomb on a U.S. airliner during his trial so that he would get a mistrial. And guess what? The crash of TWA Flight 800 occurred on the eve of the most damning evidence against Yousef being admitted at trial; and the very day after the crash Yousef, who was representing himself in federal court asked the Judge for a mistrial. Have you ever heard of that connection? Ultimately the NTSB was unable to determine the exact source of explosive residues found on the wreckage. Some of the possibilities considered were contamination from the aircraft's use in 1991 as it transported troops during the Gulf War, or its use in a dog-training explosive detection exercise about one month before the accident. But when you can't make a definite determination, what is the best way to deflect from your lack of competence? Why, state what it "was not", of course. So the final NTSB Report states that with the lack of any other corroborating evidence associated with a high-energy explosion, their investigative team concluded that "the in-flight breakup of TWA flight 800 was not initiated by a bomb or missile strike." So now, here we are in 2013, nearly 17 years to the date of this fateful crash. Last month, six members of the original investigation team, now retired, filed a petition to reopen the probe. As Fox News has reported, the group is comprised of people who worked for the National Transportation Safety Board, TWA and the Airline Pilots Association, all of whom have since retired. All six say that the evidence shows the plane was brought down by a projectile traveling at a high speed. They also say there was an active effort within the federal government to make the crash look like an accident despite evidence of an external explosion. Hank Hughes, a retired senior accident investigator for NTSB, said probers were not allowed to seek answers once the FBI took over the crime scene. "We just want to see the truth come out," Hughes said. "We don't have hidden agendas. The only thing we are looking for is the truth. It was either a terrorist attack, that they wanted to ignore, or an accident as a result of a military operation that went wrong." So now the question remains ... will we get the truth this time? Do we have any more evidence that the authorities are interested in seeking the truth? If you are as fascinated as I am about this mystery, you might want to watch the trailer for a new documentary on TWA Flight 800 and its alleged coverup. After all, there's nothing like a good mystery is there? Exodus 23:7 "Keep far from a false charge, and do not kill the innocent and righteous, for I will not acquit the wicked." One thought I've always had on Flight 800: I really, really doubt the whole US Navy accidental missile launch theory. Mostly because I can't imagine keeping several hundred sailors quiet about something like that. If it happened, somebody would have said something. No way to bottle up that many squids. My thoughts exactly! Which tells me that the missile theory is probably correct and the government couldn't have the possibility of a terrorist attack out there in an election year, so let's just start the rumor that it could've been the Navy, which would make for a convenient scapegoat. Oops! That doesn't look good either, so let's just make it an accidental explosion involving the fuel tank. I just hope that the truth finally comes out!